Tropical forests contribute significantly to the global carbon cycle, yet the relative importance of tree diversity on key ecosystem processes such as root decomposition remains unknown. We examined the influence of tree species richness on root decomposition over 485 days at two sites in Panama with contrasting soil fertility. Diversity effects on decomposition rates were calculated where 1) overstory tree species richness and composition matched that occurring inside root decomposition bags and 2) where roots of contrasting species richness decomposed under a common tree overstory. In addition, we tested 27 root traits to identify those that contribute to predict root decomposition in tropical forests. Tree species richness did not affect root decomposition rates, neither when species were manipulated within bags nor with varying tree overstory richness. 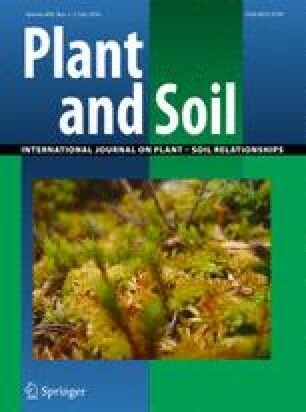 Root carbon quality and micronutrient concentrations such as manganese explained 47 and 81 % of the variation in decomposition rates in the fertile and infertile site, respectively, demonstrating that the relative importance of traits was modulated by the soil environment. Our results suggest that root decomposition in tropical forests is mediated by root functional composition and the soil environment rather than by species richness. The online version of this article (doi: 10.1007/s11104-016-2828-y) contains supplementary material, which is available to authorized users. This study was made possible due to the collaboration of members of the Sardinilla Project, the Agua Salud Project, the Smithsonian Tropical Research Institute (STRI) and the Center for Forest Research (CFR). We thank Jefferson Hall for permission to work at Agua Salud and for his feedback during project development. We thank Jose Ceballos (STRI) for microscopy assistance; Jose Monteza, Santiago, Abdiel, and Lady Mancilla for field and logistical assistance (Sardinilla); Daniela Weber, Anabel Rivas and, Federico for field and logistical assistance (Agua Salud); Tania Romero, Dayana Agudo, and Luis Ramos for support in the soil lab (STRI), Bill Parsons for C, N and fibre analysis assistance (CFR) and Alain Paquette and Steven Kembel for revising earlier versions of this manuscript. This study received support from a Young Researcher’s start-up grant by the Fonds de Recherche, Nature et Technologie du Québec to ITH, NSERC Discovery grants to ITH, CM and CP and a fellowship from the Quebec Centre for Biodiversity Science to NGR.